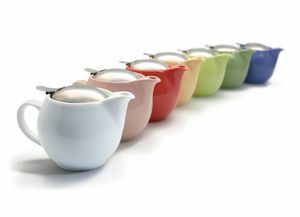 Koji Inoue was working at a Japanese porcelain manufacturer when he first thought of creating his own range of teapots. He longed to express his creativity; blending beautiful and functional design with rich tradition. The idea grew so compelling, Koji quit his job one afternoon to pursue creating what is now known as Zero Japan. In designing Zero Japan, Koji was driven by the Japanese pursuit of balance. All elements of the teapot range work in harmony with each other: the round shapes soften clear cut lines; the design combines practicality with strong, smooth shapes and interesting finishes—including a traditional Japanese style kikko crackle. One of the most striking aspects to a Zero Japan teapot is its stainless steel lid. While it looks beautiful, Koji actually designed it to solve a problem for his mother, after she accidentally broke the lid of her favourite teapot—it just slipped off and the porcelain shattered. Upset, she asked to Koji to please find her a spare lid she could use but he could not find one. In fact, Koji discovered that many Japanese households had similar experiences, having no lid for beautiful teapots as they often slipped and broke. Koji ended up buying his mother a new teapot. With this in mind, he started designing the durable, stainless steel clip-on lid featured on all Zero Japan teapots. It allows the pot to be easily used with one hand; as the lid is clipped on, it will not fall off. Needless to say, Koji's mother was very happy! This is the very scene that inspired the range of 40 colours Koji uses in Zero Japan! With so many colours, finishes and shapes to choose from, Koji hoped people would have the freedom to express their own creativity through Zero Japan, just as he did when he designed it. The spout of every Zero Japan teapot is created by hand, so each lip pours a long, thin stream of steaming tea which falls precisely into your cup. The attention to detail is such that Koji himself hand-checks every pot. Koji knows that a beautiful looking teapot alone does not make beautiful tasting tea—so he put a lot of effort and thought into creating what lies under each lid. A stainless steel infuser is suspended over the rim, which, after your first cup, keeps the tea leaves clear of the water to prevent over brewing, and ensures every cup of tea tastes as good as the first. This is particularly useful when brewing Japanese or Chinese tea, which can be used for several infusions. The filter cup is wide and deep, giving the tea leaves enough room to fully unfold and release their flavour. Tea is as much a ritual as it is a beverage and in cultures all over the world it is a time to gather with special people and pause; to enjoy each other’s company and tell each other stories. Koji invites you to share his own story, a pursuit of creative freedom, through your own Zero Japan teapot. 350ML APPLE GREEN TEA POT.